Choose 107" x 12yd (2.72m x 11m) or 107"x50 yd (2.72mx45.72m) Savage Seamless Paper provides a high-quality, non-reflecting surface with an exquisite, fine-tooth feel that’s ideal for creating smooth and even backgrounds in portraits, commercial photography, product photography, video photography, and much more. Widetone is a high-quality, non-reflecting paper background with an exquisite, fine-tooth feel that belies its inexpensive price tag. Manufactured in our on-site plant, Widetone is core-wound and comes wrapped in a plastic sleeve. Colors run from the basics to the exotic and just about anything in between. Need a special color for a special client? We have 68 to choose from, including Tech Green and Studio Blue for chroma key work. Need to compare colors? 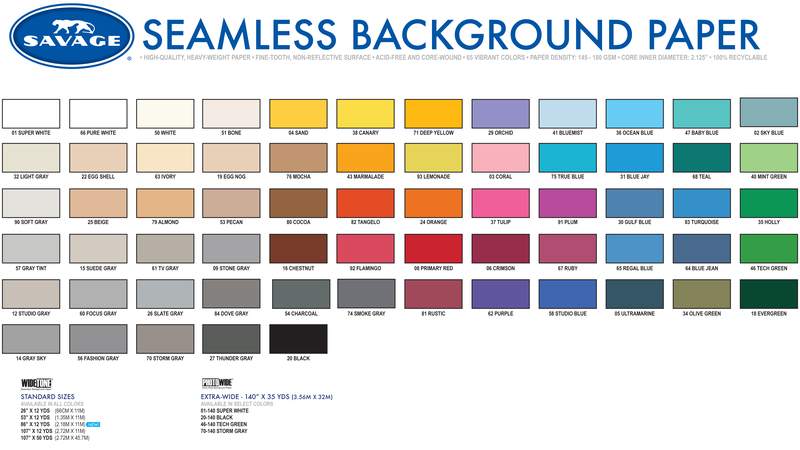 Ask for our Savage Seamless Background Paper color swatch chart. All Savage Widetone comes in four sizes: 26” x 36’, 53” x 36’, 107” x 36’, and 107” x 150’. Drop-ship from Arizona, allow additional 1-2 days processing time to ship.